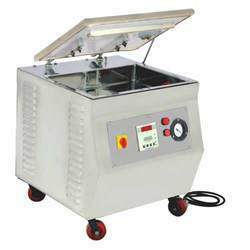 Leading OEM Manufacturer of vacuum packaging machine and single chamber vacuum machine from Rajkot. pharmaceutical industry to pack medicines and other industries. Also, this machine is tested against various quality parameters. Operation: As soon as you press down the vacuum case lid the machine automatically starts the process of vacumisation, sealing and flushing (Optional). Application: The packed product is prevented from oxidation, rusting, moulding, dampness and insect infestation. This helps prolong the product storage period. Also useful to detect integrity of the pack seal. Area: Food, Pharma, Engineering goods, Medical disposables, Electronic goods etc. Weight 110 Kg. 180 Kg. We are remarkable entity, engaged in trading and supplying an excellent gamut of Single Chamber Vacuum Machine. 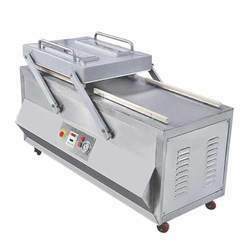 Sourced from the authentic vendors of the market, our provided machine is manufactured under the vigilance of adroit professionals using the optimum quality components and cutting edge technology. The offered machine is used in engineering goods, medical disposable and electronic goods. Moreover, this machine is available in numerous models and technical specifications for our precious clients. Operation: As soon as you press down the vacuum case lid the machine automatically starts the process of vacuumization, sealing and flushing (Optional).